﻿Only two weekends left to see those wondrous butterflies at Krohn Conservatory. Make sure to Google – there are some great discount tickets out there! Volleyball lovers in your clan? Miami Middletown’s 2010 volleyball team and Coach Scott Garver will host a two-day volleyball camp for boys and girls entering the 7th, 8th or 9th grade. The camp will be held on Friday, June 12 from 6 p.m. – 8:30 p.m. and on Saturday, June 13 from 10 a.m. – 5:30 p.m. in the Bennett Rec. Center at Miami Middletown. Cost is $40 per participant. For more information or to register, call the Office of Athletics at (513) 727-3317 or Coach Garver (513) 461-1623. Miami Middletown is located at 4200 N. University Blvd. What can I say? They had me at their tagline: Fringe. Kinda Weird. Like you. Fringe continues on through tomorrow with jam-backed line-ups to bring out the weird in all of us. This festival is not to be missed and trust me, your kids will thank you. Be sure to check out our Festival listing too for events in your area! The Downtown Book Sale at the Public Library of Cincinnati and Hamilton County happens today (Friday) from 9am to 6pm and it’s BAG DAY! What kid doesn’t love to dig things up (read: get dirty)? Can You Dig It?, 2 p.m., Winton Woods, 10245 Winton Road, Springfield Township. Winton Centre. Vehicle permit required. 513-521-7275; Great Parks. I’ve been excited to check out Families Create, a joint venture between Taft Museum and Weston Art Gallery. 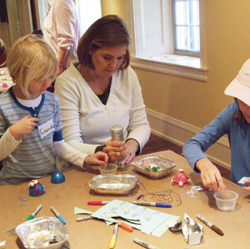 Families Create: Photo Fun in the Sun, Saturday (June 12), 10 a.m.-12 p.m. There is a minimal cost for this program, contact Taft Museum for all the details. Just stumbled upon this over at Cincinnat.com – how cool? Bring your future pilot to the Young Eagles Rally, 8:30 a.m., Clermont County/Sporty’s Airport, 2001 Sportys Drive, Batavia Township. Hawk Building. There will be free airplane rides for kids ages 8 to 17 as long as parents or guardians sign their permission. Registration required. 513-735-9500; www.eaa174.org. And this remains on my to-do list (darn Saturdays fill up so quickly in the Summer! ): Family Days. Every Saturday in June, Fountain Square is all about children ages 8 and under! This is the second year for Family Days and this year’s theme is children’s authors. The fun begins at 10am and runs until noon, so beat the heat and spend the morning on the Square with your little ones! Kids can enjoy art-making, story time, playground games, mascots and more. Bring your favorite pooch and head to Voice of America Park for Dog Fest Saturday and Sunday! They are asking for a $8 donation per carload – a small price to pay as the proceeds benefit the event’s host – Progressive Animal Welfare Society Adoption Center (aka PAWS). Both days are “pack’d” solid (get it?) 11am – 5pm and our family is definitely going to try to squeeze in a visit! Because guess what? SNOOPY will be there – that dog is really making the rounds in Cincinnati!! I love quilts – someday I’d love to make one of my very own, but til then – there is the Bicentennial Barn Quilt Tour. In partnership with the Clinton County Convention & Visitors Bureau and the Clinton County Historical Society, the Clinton County Bicentennial Barn Quilt Trail kicks-off the celebratory season with the Bicentennial Barn Quilt Tour on Saturday June 12 (10am-6pm) & Sunday June 13, 2010 (12pm-5pm). Find all the details here. Admission is $12, but children 12 and under are FREE! Read all about the free concerts happening all over the area – all summer long! Voice of America Park has a ton going on – and not just for the doggies (Dog Fest continues Sunday 11am-5pm)! Later this Summer, VOA will host the Annual Cardboard Boat Regatta and you can get started on your own boat this weekend with the help of cardboard boat experts. Cardboard Boat Building Seminars: Sunday, June 13th at 1pm & 3pm at the Miami University VOA Learning Center on VOA Park Drive. Then after you have your cardboard vision figured out, stick around for their first concert of the season: Jump ‘n Jive Show Band will be at VOA Park this Sunday, June 13th from 4-7pm! Missed Saturday’s Families Create? No worries – Taft Museum is FREE FOR ALL on Sundays, so go stroll around and get inspired. 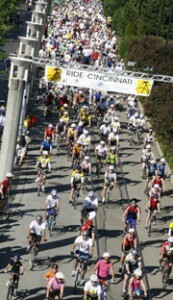 My own Little Miss P will be riding in her first bike “race” on Sunday thanks to Ride Cincinnati. Not only do they put on a pretty awesome outing that is super family friendly – all proceeds raised (nearly $250K so far this year) go to breast cancer research being done right here in Cincinnati. That’s what I call a win-win! I’m pretty proud to say that Team P has raised over $150 which is pretty cool for someone who can’t count to 150! Chill out on Fountain Square as PNC’s Music Series rocks on – R&B, Gospel and Soul are featured on Sundays this Summer. Whatever you do this weekend, have a great one – enjoy the weather and make sure you stay hydrated! We’d love to hear how you plan to spend your family friendly weekend in Cincinnati – especially if we’ve missed something super fun! Please leave a comment below!